Crazy busy. That has to be the biggest understatement for the Misener family this past week. It all started (and we like to tease August about it) when August got the combine stuck. We were driving in mud that was two feet deep in places, but he is the only one that buried the big green beast. I think it's safe to say he is now officially part of the family. We didn't even need to get a tractor to pull him out, we just unloaded the hopper. With the four-wheel-drive and a lot of backup power we were able to get him unstuck and cutting again in a few minutes. This is what we were driving through. 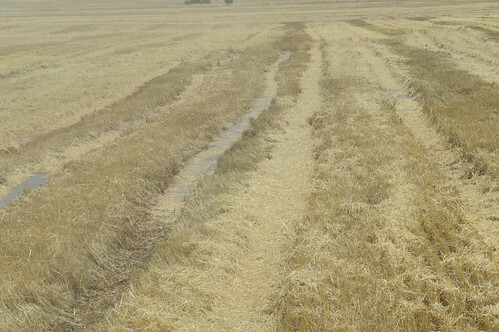 In the low parts of the fields, the water was easily up to one to two feet deep. 30 May Megan: Carmen, Okla.